In the Tourist because so much of the computer screens used surveillance video that was going to be shot later, we ended up compositing most of the screens in post production. In the Scotland Yard set we decided to shoot the screens off so that we could get nice reflections of the actors that we could blend back in with the computer graphics that were built by Coplin LeBleu. All the 50+ VFX monitor shots in the film were composited in Adobe After Effects. We also had to match the color and look of the screens that were shot on set. The three screens behind the 2 standing actors were live on set and the screen on the lower left is one I composited in post. Again in this shot I needed to replace the bottom left screen with a different surveillance video while still matching the look of the other monitors in the original shot. Also needed to replace a phone screen in order to make the action of taking Jonny's picture more visible. Posted on June 4, 2014 by Vincent Parker and filed under Film, Video Playback, Visual FX and tagged Film Video Playback Visual FX. Often in when doing playback graphic on a feature film I need to take existing images wether it's a computer desktop, smart phone screen, software application, news graphics, etc... and add the fake "movie" story content to it. In Wall Street: Money Never Sleeps I needed to take existing stock monitoring software and add the Keller Zable (KZI) our fake company I the film to it and make it's stock data match the story. I also animated the stock ticker animation used to project on Shia LaBouf's face. Most of the story driven news segments were shot on green screens. I needed to build the final composites early in production so they could have them for playback on set. As well as tracking the shots and building the final comps. 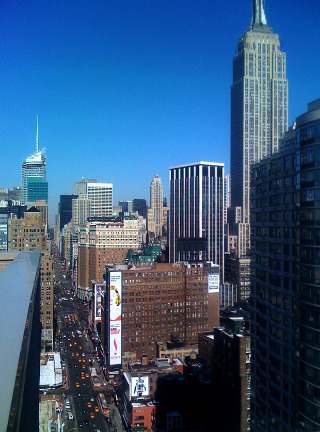 It is actually a photo I took on my iPhone from the top on the building I was staying in while I was there shooting The Taking of Pelham 123. I cropped, retouched, and flipped it for use in the composition as the backdrop for the news segment. Posted on May 26, 2014 by Vincent Parker and filed under Film, Video Playback, Visual FX and tagged Film Video Playback Visual FX.